Okay, a little off topic, but if you happen to own an iPhone, iPod Touch or iPad, here are some great free apps you can download. They’re a great way to supplement your Wii workouts, or to let you exercise when you’re on the road and don’t feel like traveling with the Wii. Thanks for Gator Bait at Slickdeals for the info! Now that 2011 is drawing to a close, I thought I’d do a retrospective of 3D games released in 2011. 2011 saw an influx of “native 3D” games versus games which were developed solely in 2D and converted after-the-fact. This meant that instead of 3D being a gimmick as in the case of many games from 2010 and earlier, in 2011 game publishers finally started to use it as a necessary part of the games. I’ve posted the complete list of 3D games released for the PS3 in 2011, followed by their publisher, age rating, and release date. I’ve also indicated whether the game includes Move support (which in many cases provides an even more immersive experience) as well as whether it’s a PSN exclusive or not. I’ve also posted in ratings from four sources. From my experience, I’ve found that each of these four sources can be very flawed at times, but when taking all four together, it provides a pretty good indication of how good a game is. Amazon reviews are based on user ratings from Amazon.com as of 12/31/2011. I’ve found Amazon ratings to be mostly accurate, but they tend to be on the generous side because users who purchased the game will tend to vote up games to justify the expense they paid, and game publishers’ PR departments routinely use fake reviewers to pump up rankings. This is why I turn to GameFly as a second opinion. GameFly generally has more votes and because users don’t pay a lot for the games they’re more likely to be objective. On the flip side, because reviewers may rent a title “for a lark” and may otherwise not be very invested in the game, this may cause ratings to be a little lower than they should be. I look to Gamespot and Metacritic as the “third opinion”. These game reviewers are generally on target, but now and again they’ll let their bias against certain companies or technologies show. Of course, one other thing to keep in mind is that these ratings are based on the game as a whole, not necessarily the 3D implementation alone. Having said that, if a title has high rankings on all four fronts, chances are it’s a pretty good game that you’ll be happy with. After playing a number of games for the Playstation, there are a few that jumped out at me as simply stunning in 3D. Best thing about it, a lot of these games you may already have on the shelf, but with your Playstation 3D display you’ll give it new life. 1) Uncharted 3: Drake’s Deception – The original Uncharted set new standards in video gaming for a story line worthy of Hollywood screenwriters, an amazing soundtrack, and incredibly detailed graphics and virtual worlds. Uncharted 3 adds to the list absolutely fantastic 3D. The rooftop views of London by night are so extraordinarily beautiful that I had to pause to just admire it. The 3D effect is amazing, and absolutely enhances the game play (this was the first game where I really felt like objects “floated” in front of me). This is a game that is close to perfection and is definitely a “must have” in your collection if you want to own the best of the best in 3D games for the PS3. 2) Motorstorm Apocalypse – This is the game that’s bundled with Playstation 3D Displays. I’ll admit, there’s a little too much complexity in the controls and the storyline for my tastes, as I like my racing games to be just racing games. But again, the 3D graphics are extremely well done and great for showcasing the talents of the Playstation with 3D. 3) The Fight: Lights Out – This was a game I’d purchased at full retail when it first came out to use with the Playstation Move. One of my biggest complaints was that there was simply no depth perception–I’d flail away at the opponent’s face wildly hoping to make contact. This is a case where 3D is not just aesthetically pleasing, it’s essential to enjoying the game to its fullest. I can actually reach out and lay a left hook squarely in the opponent’s face, rather than just waving my hands wondering if I’m making contact. 4) Tumble HD (PSN) – This was a downloadable game on PSN that was ho-hum when I first tried the demo. It was an interesting demo for the Move, but otherwise nothing very special. But putting on the 3D glasses changes the game completely. You can move blocks in three dimensions, making the experience amazingly real. The blocks themselves with their various textures also feel more real than ever. I played the demo again and went ahead and purchased the full version immediately as soon as I experienced it in 3D. 6) MLB 11 The Show – This was another game which I thought I’d played out, but adding the 3D was like getting a whole new game. It’s exhilarating to be able to watch pitches come right at you, as well as to watch fly balls actually travel through the air. Again, I wish the Move capabilities were expanded a bit (it’s only good for the home run derby), but again it’s one of the more realistic examples of virtual reality on the PS3 so far. 7) Gran Turismo 5 – This was a game which I’d really not played in a while. I won’t say the 3D effects are as stunning as, say, Motorstorm Apocalypse or Uncharted 3, but they’re not bad especially when you use the “in car” view and experience the full depth of the steering wheel, the rearview mirror, and the view outside. So, that’s my take on games I had, many of which were sitting on the shelf collecting dust, that received new life with 3D. If you have experience playing other 3D games that blew your mind, share them here! I notice that people love to visit this site the day after Christmas. I always wondered why, and then it hit me. People get Wiis and Xboxes and PS3s for Christmas, and they also happen to enjoy their share of candy, cookies, and turkey. The confluence of events means a lot of searches for “Wii Fitness Games” and “Wii Exercise Games” the next day. Well, you’re in luck. I’ve been reviewing Wii fitness games for almost three years now. Over the years there have been some spectacular ones and plenty of duds. Here on Nutwiisystem.com we try to review all of them. You’ll see an unbiased review here on the blog, and you can also go to our list of the best Wii exercise games to see the best of the best. One question I hear a lot is, is it really possible to lose weight using video games? The answer I always give is the same one. Yes, but only if you STICK to it and really put all of your energy into it. In other words, sitting on a sofa playing Super Mario Kart is probably not going to do it for you. But if you get off the couch and dance with all your energy to Just Dance 3 or stick to the predetermined schedule of EA Sports Active 2, as long as you’re breaking a sweat and your heartrate is elevated for a good 20 minutes, and you’re controlling your portions while you eat, you WILL lose weight. So take the rest of the four days off, but starting on January 1, 2012, let’s make a resolution to jump, dance, and Wii our way to fitness! The success of Just Dance franchise have spawned a dizzying number of “copycat” games that use motion controls to let you do “real dance moves”. This holiday season alone there have been more than 20 different games across the three major platforms. It’s enough to give anyone dance game fatigue. The latest entrant into the morass is Get Up and Dance by O-Games. That’s right, the same company that brought you that fun game Jewel Time Deluxe and John Daly’s ProStroke Golf. Not to be confused with Bejeweled or Tiger Woods PGA Golf. No really, they’re completely different. All sarcasm aside, throughout Get Up and Dance you can see the resemblance to Just Dance. You select songs to dance to from a “cover flow” interface and see icons which represent the number of dancers, complexity of the song, and “cardio points” representing the intensity of the song. At first I thought there were a lot more songs, but that’s because in the cover flow interface they repeat several titles in a fairly confusing way. Each song lets you choose a short version (about 1-3 minutes long) or a long version (about 3-5 minutes long). Up to four players can dance at a time. All will dance to the same choreography unless there are lead & backing tracks, in which case all players will dance to one of two routines. Each dancer can also select or create a profile to keep track of their scores (there are four default profile names called “Boogie”, “Bouncy”, “Jitterbug”, and “Vogue”–the user interface is so confusing that it took me a while to figure out what these were…at first I thought they were difficulty levels or dance styles. Instead of being cute I wish they could have stuck with the more intuitive “Player 1”, “Player 2”). Each player presses the Move button and the glowing orb will glow in a different color. When you get to the dance screen the interface again is eerily reminiscent of Just Dance. You have to mirror the dance moves of a dancer on the page, which happens to be a glowing white silhouetted figure dressed in bright colorful clothes. There were only things I noticed that prevented this from looking like a complete ripoff of Just Dance. First, the icons representing your moves are displayed scrolling down vertically on the left of the screen for lead tracks (on the right of the screen for backing tracks). I found this a lot less easy to follow than the cues on Just Dance, but after a while I got used to it. Secondly, the actual full-screen music video of the song by the original artist is playing in the background of the screen. This I found terribly distracting. While you’re trying to focus on your own dancer’s movements, the video in the back is constantly in motion. As a result, you don’t really enjoy the video, and it becomes a chore to try to focus on your dancer’s moves. I much prefer the approach taken by the PS3 Everybody Dance, where the video is playing in a self-contained box on the page which you can turn on and off. Finally, the choreography. To be honest, I found it a bit lackluster. It didn’t have the technical complexity of a Dance Central 2 nor even the fun and quirky personality of Just Dance 3. In both those games, it was clear that a professional choreographer had designed the dance moves in the spirit and style of the original artist. In this case, you go through to motions of jumping and moving your hands up and down and in circles, but in many cases the moves seems generic and uninspired. As derivative and lackluster as the gameplay is, there are a handful of improvements over Just Dance. I do like that they show the “time elapsed and time remaining” on the top of the screen, something useful for workouts that I wish Just Dance would have as an option you could turn on and off. I also like that they give you the option of using two controllers–one in each hand–which can help get your scoring and get you more immersed in the dancing, although it’s certainly not mandatory. I also like how you can break down your accuracy in different parts of the song and go to “Rehearse” mode to practice any given section. The game does have a lot of interesting options for multi-player play under the “Get Up and Party” mode. There’s “Team Classic”, where two teams of up to four can compete head-to-head to see who can get the best score. “Last Man Standing” is an interesting game where two teams of up to two players each can do a “dance off” to see who dances the best. “Tug of War” is a fun variation of this, where the stronger team will win a virtual tug-of-rope game the more accurately they dance. There’s also a “Shape Up” mode. After you set your profile, you can select one of five levels ranging from Beginner to Intense, which basically dictate how many songs you’ll dance to each workout session. There are some specially choreographed songs that play more like aerobic routines than dance routines, which can help maximize your workout. When you play the songs, you’re not graded based on how accurately you move; instead, you’ll see a counter of “cardio points” which just go up every time you move your controller. Of course, you’re on the “honor system” to do it right–you can rack up thousands of cardio points by just sitting on the couch and spinning your hands, of course there’s no point in doing that. A graph will show you your progress from week to week. There’s also a mode called “Get Up and Dance Group” which is basically like a “career mode” where you and some friends can go through a series of “talent competitions”. It may be fun for kids to play this mode so they can pretend they’re competing on reality shows, but other than that it’s nothing special. 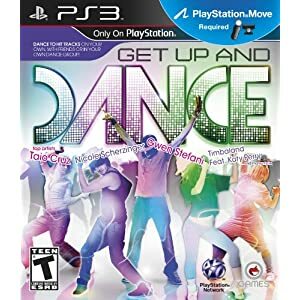 At the end of the day, I’m guessing the primary purchasers of this game will be people who want to save a little money (the retail price of the game is $10 less than Just Dance, although street prices make them about equal right now), and grandmas who see the title “Get Up and Dance” on the shelf and assume it’s Just Dance. Having said that, I would put the production quality of the game a hair above shovelware. I would say it’s a worthwhile purchase if you happen to like any of the songs in the playlist, or if you play in groups and have played Just Dance so much you need a little change of pace. But other than that, in a world with fifty gazillion and one dance titles out there, there’s really nothing too special about this one. 3.5 of 5 stars. So what Did President Obama Buy at Best Buy? By now, you’ve probably heard the news that President Obama stopped by his local Best Buy to do a little Christmas shopping. Okay, we all know it was a photo op, because quite frankly, all the President of the United States needs to do is snap his fingers and he can have every video game in the world delivered to his front door, as well as have two Secret Service agents play them and get high scores for him. Anyway, in case you were curious as to what he bought, the answer is…Just Dance 3! (in addition to a $100 iTunes gift card and The Sims 3: Pets for PC) As good as the deals from Best Buy have been this year, someone should have told the president that he could have gotten it $10 cheaper at Amazon . But maybe he was willing to shell out the extra $10 for the Best Buy Katy Perry bonus tracks . Addressing the crowd of Christmas shoppers, he said “In case you all are wondering, Just Dance for the Wii,”which must have sent a tingle up the collective legs of Ubisoft and Nintendo and cause a lot of folks at Microsoft to consider voting Republican. Sometimes the best things come to those who wait. Just a few weeks ago I ran to my local GameStop to get the Playstation 3D Bundle for $499.99. Today it’s on sale at Best Buy for a ridiculous $299.99. I thought it was worth it at $500, but for $300 it’s a steal. Jump on it while you can! Playstation 3D Display a ridiculous $299.99 at Best Buy right now! One thing that I and I’m sure a lot of you are pretty ticked off about (other than the fact that the price has been slashed only a few weeks after we early adopters shelled out a lot of money for it) is that the Playstation 3D Display didn’t come with a remote to be able to control the volume. Instead, we have to awkwardly reach back and try to fiddle with five identical-feeling buttons. Worse, those of us who bought the original Playstation Blu-Ray Remote were probably surprised to find that–the old remote doesn’t even have a volume control. Sony has since released a new new PS3 remote control which indeed has a volume control (pictured to the right). It’s a great way to get an updated remote that works with the PS3 3D Display. But at $20, it’s a bit steep to pay for another remote control, especially since I already shelled out more than at for the last remote (it would have been nice for us early suckers to get a “trade in”). Here’s a cheap solution I stumbled upon. Do you have an old Universal Remote lying around the house? I actually have a whole box of old Phillips remote controls which I got from Woot in one of their Bag of Crap sales. I pulled one out and just for kicks entered the first Sony TV code I found. The one oddity was the TV/VCR button, which I could use to toggle between the modes (HDMI1, HDMI2, COMP). And of course, the irrelevant buttons (channel selection, number buttons, VCR controls) had no purpose. Just for kicks, I tried a very old remote I had from an old Sony VCR (remember those things?) To be surprise, the volume control worked fine on that as well, as did the TV/VTR button (which again toggled between the modes). The menu button didn’t work, though. Anyway, I was quite pleased with myself that instead of shelling out another $20, I could use old remote lying around the house for the same purpose. If you’re annoyed at having to reach to the back just to change volume, you should try it too.